Like you, the staff of Floating Systems are addicted to music and high-fidelity. Music, loaded with emotions and sensible vibes. With your eyes closed, you should be able to exactly locate every instrument and each musician in space, as if they were 'life'. For more than two decades now, our quest for the ultimate sound-reproduction has been the main-spring in the development and construction of exclusive loudspeakers. Based on a principle of acoustical disconnection, Ivan Schellekens has designed two speakers: the Floating Cameleon and the Floating Synthese. Thanks to the ingeniously suspended tweeter, all mechanical contact between the textile dome tweeter and the cabinet is avoided. As a result material deformation, caused by the heavily vibrating woofers, is inexistant. Music becomes more vivid and dynamic. Voices stand free from instruments. The starchy and stable construction of the panels allows the air-molecules at the outer side of the cabinet to remain immobile. This combination of rigidity and stability results in a very precise and clearly defined low-frequency response and a very extraordinary broad spatial image. Click here to read more about the Floating Synthese or here to read about the Floating Cameleon. Ivan Schellekens is born in 1945 in a little village near to Antwerp, in Belgium. Since his childhood he was fascinated by electronics and hi-fidelity. At the age of 13 he realised his first hifi-stereo-loudspeakers. This was the start as a long career as a hifi-specialist. After his studies as electronic engineer he first w orked as a consultant in room-acoustics. In the 70's he wanted to develop home-speakers. The first models were rather conventional boxes. Having always felt a profound respect for a natural sound reproduction, he could hardly resist to always strive for better quality. His wish for a speaker-reproduction 'as natural as music itself' was born at an organ-concert with soprano-accompaniment in a cathedral. Voices stand totally free from the organ music! 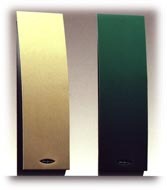 The very high-quality "Synthese"-speaker with a design look became reality in the 80's. "Synthese" got the most praising comments in the hifi-magazines and general press in the surrounding countries: France, Germany, Swiss, the Netherlands... and even Japan. In the 90's Ivan Schellekens specialised in development and construction of exclusive loudspeaker-systems, based on the same principles of acoustical disconnection in a more accessible price-range and suitable -in sound and design- to most living- and li stening room (click here to see for yourself). His latest creations: the "Cameleon"-series: Cameleon III, Cameleon Princess and Cameleon Queen, correspond totally to these features in view. With the 'Cameleon'-series Ivan Schellekens aimed to create a contemporary though timeless high-quality design-speaker.